My dad, sister and I have a joke about the fact that we think differently than most people. Whereas most people’s thoughts logically progress from Point A to Point B and then to C, D, E and beyond, we’re more like a stone that you’ve skipped across the surface of a pond. While we cross over those same points as everyone else, we only touch the surface every other point or so, which sometimes makes it difficult for others to follow our thought progression. I only mention it because the manner in which tonight’s art project unfolded serves as a real-life example of that process of thought progression come to life. Earlier this week, I finished a crochet project (yes, it does occasionally happen). 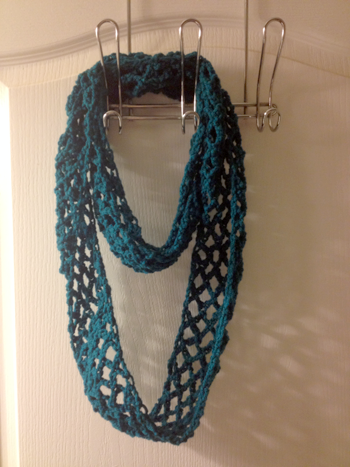 The project stemmed from a pattern for an infinity scarf that I’d “pinned” early last month. Last night, we re-watched the Hunger Games, and I took the opportunity to finish the pattern. It’s teal, of course, in honor of my beloved Jacksonville Jaguars. I’m hoping it will come in handy during some of our winter games, although in Florida, one can never tell how winter weather will be, but I digress. But getting back to the subject of this evening’s project, I knew I wanted to do something crafty, but was at a loss for what to do. Then I remembered the rustic print from Natural Life, was inspired by its charming quote, and decided to try my hand at making my own bit of wall art (although narrowing down a single quote to use for the painting was tough). To kick off the project, I grabbed the above-mentioned used canvas and painted a purple base coat over its predecessor. While I was waiting for the base coat to dry, I amused myself by making a little nonsense video and posting it to my Instagram account. Once the purple coat was dry, I used a rough brush to add a neon pink coat, and before the paint was dry, took another rough brush without paint to texture the surface and blend the two coats. 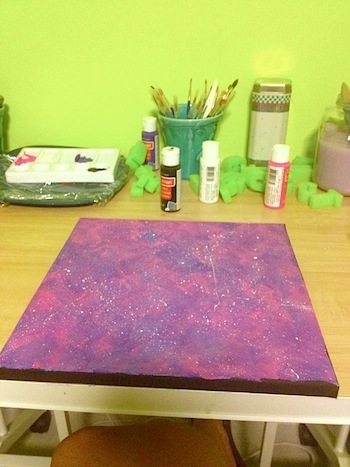 Using a small brush, I painted the edges of the canvas black, then splattered white paint across the top of the canvas to add some interest to the purple/pink background. So what about the quote? Here’s where we get to the “geek” part of the post. In thinking about what I wanted to place on the canvas, I began reflecting on some of my favorite quotes from movies and books I feel in love with during my childhood. 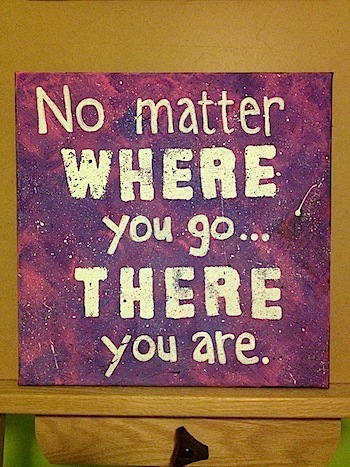 Given the size of the canvas (and my letter stencils), I knew it would have to be something short and to the point. “Who is this Buckaroo Banzai?” you ask. Excellent question. 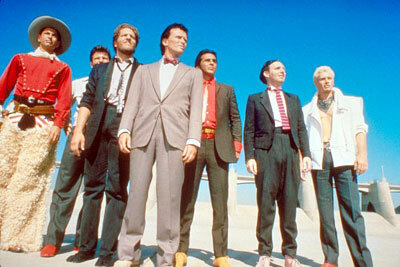 The multi-talented Dr. Buckaroo Banzai is a physicist, neurosurgeon, test pilot, and rock musician, who has to save the world by defeating a band of inter-dimensional aliens called Red Lectroids from the Planet 10. The novel and movie fuse the genres of action/adventure with science fiction while weaving in elements of comedy, satire, and romance. Rawhide, Buckaroo’s lieutenant who also plays piano. Reno Nevada, who plays saxophone. Pinky Carruthers, one of Buckaroo’s Blue Blaze Irregulars who also plays bass guitar. 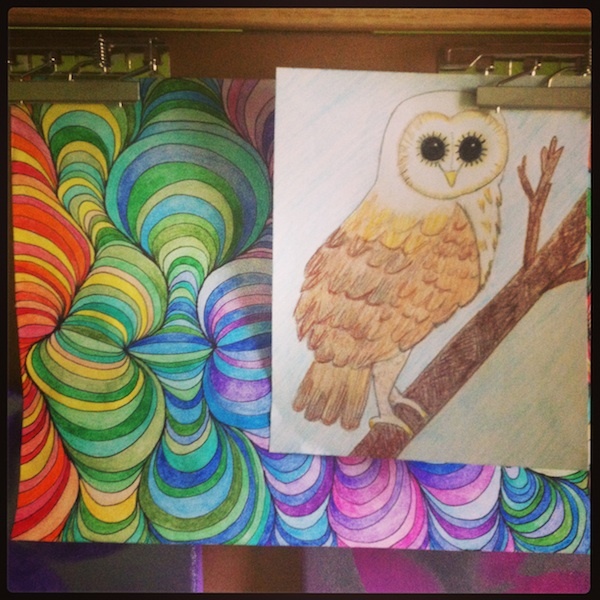 And because, I’ve probably kept you long enough – the finished work! I was pretty happy with how it turned out, although if I do another quotes canvas, I’ll likely make some tweaks to the process. It could be fun to do a whole series using my favorite quotes from Moonheart, Lord of the Rings, Doctor Who, Harry Potter and more. Which begs the question, actually, what’s your favorite quote? Admerica 2014 – On the Road to Boca Raton! © 2019 Aliera Peterson. All rights reserved.